Butternut Squash is beautiful, healthy, and hearty enough to adapt to nearly every cooking application I can think of. The natural sweetness is delicious when paired with other sweet items such as apples, onions, even brown sugar. But to me, Butternut squash is at its best when highlighted with savory elements such as curry, chiles, garlic, and fish sauce. I love Middle Eastern flavors stuffed inside the cavity of Butternut squash, such as lamb, cinnamon, saffron, and basmati rice. It’s also incredibly tasty when paired with strong cheeses like gorgonzola and Pecorino. A perfect side to any main dish is deeply caramelized squash, especially when roasted with purple onion and garlic. I also love steaming Butternut squash and pureeing it with salted butter and chicken stock or dashi because it creates a glossy, vibrant sauce or puree, depending on the amount of liquid used. And if you are lucky enough to own a spiralizer, Butternut squash noodles are surprisingly satisfying and filling, especially when simmered in spicy, roasted garlic tomato cream sauce. Lastly, please remember that it’s not just about the flesh! Butternut squash skin is absolutely delicious when deeply roasted; no need to worry about peeling! Sage and butternut squash are a classic pairing. This is my riff on that pairing - a combination of squash wedges roasted at a very high heat topped with a hazelnut, sage, and ricotta salata pesto-ish topping. The finished dish is great hot or at room temperature. Preheat the oven to 500 and place a rack in the lowest slot in the oven. Line a baking sheet with parchment. Peel the butternut squash, cut in half lengthwise and remove the seeds. Cut each squash half in half widthwise, right where the slender part curves out to the bulge. Cut each quarter into about 1 inch wedges and place in a bowl. 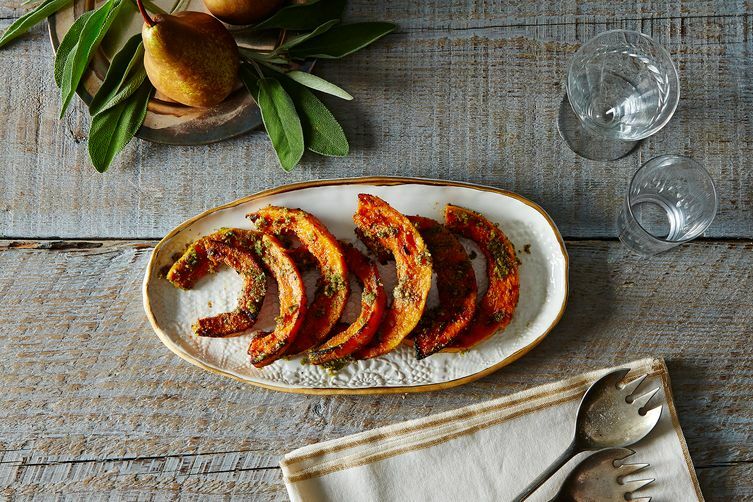 Toss squash with olive oil, sugar, salt, and cayenne. Place in a single layer on baking sheet. Roast for 10 to 15 minutes until caramelized. Remove from oven and flip over. Bake another 10 to 15 minutes until caramelized on the other side and cooked through. The pieces on the edges of the baking sheet will caramelize first so you want to move around during the baking time. Warm 3 tablespoons olive oil, sage, and garlic in a small pan over very low heat just until the oil bubbles. Pour in a small bowl, reserving the garlic clove. 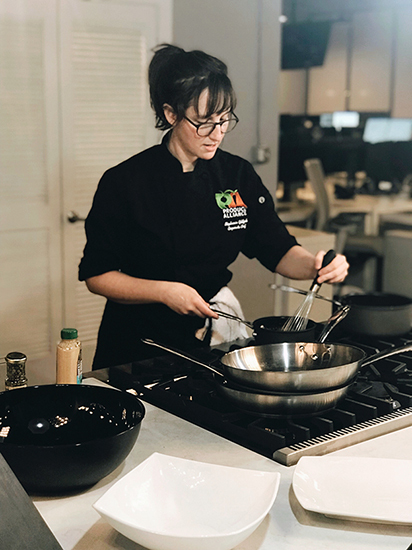 Place the toasted hazelnuts in a food processor along with the garlic clove and process until a fine crumble and add to the bowl (alternatively, you can do by hand or in a mortar and pestle). Add the cheese to the bowl along with 1 to 2 tablespoons more olive oil and stir until combined and salt to taste. This is not a traditional pesto -- more nutty than herby and not so much oil. Once the squash is roasted, place in a large bowl and toss with pesto to taste. Dig in.